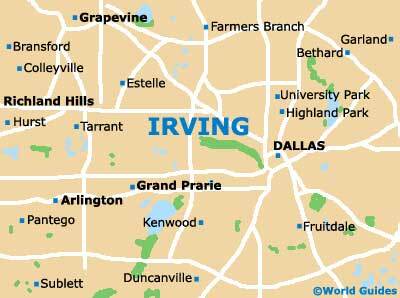 Situated within the northern Texan Prairies and Lakes Region, the city of Irving is greatly influenced by its larger neighbor Dallas and actually belongs to the Dallas-Fort Worth Metroplex. The two cities enjoy good connections, provided by Texas State Highways 114 and 183, as well as Interstate I-635. For sightseers keen to make the most out of a visit to Irving, the city comes with a number of attractions to make a note of. Hard to miss is the sculptural masterpiece named the Mustangs of Las Colinas, where wild horses are depicted galloping across a stream. Art exhibitions and theatrical events are regularly staged at the Irving Arts Center, while golf courses, restaurants, shopping complexes, large parks and many nearby attractions add to the list of offerings. For travelers planning a holiday in this part of Texas, the Irving links below have been sourced to help with your plans. Irving Convention & Visitors Bureau - 500 West Las Colinas Boulevard. City of Irving, TX - Official Site - 825 West Irving Boulevard. Irving Arts Center - 3333 North MacArthur Boulevard. Gondola Adventures - 357 West Fork. Stand Up Paddle North Texas - 113 East Las Colinas Boulevard. Founders Plaza Observation Area - Texan Trail and N. Airfield Drive. Las Colinas Equestrian Center - 600 East Royal Lane. Mustangs of Las Colinas - 5205 North O'Connor Drive. National Scouting Museum - 1329 West Walnut Hill Lane. Fritz Park Petting Farm - 312 East Vilbig Road. Twin Wells Golf Course - 2000 East Shady Grove Road. Aloft Las Colinas Hotel - 122 East John Carpenter Freeway. Jefferson Street Bed and Breakfast Inn - 512 South Jefferson Street. Wingate by Wyndham Irving / Las Colinas - 850 West Walnut Hill Lane. Comfort Suites DFW Airport - 4700 West John Carpenter Freeway. Best Western Plus Irving Inn and Suites at DFW Airport - 4110 West Airport Freeway. Dallas Fort Worth International Airport - 3200 East Airfield Drive, 75261. Dallas Love Field Airport - 3300 West Mockingbird Lane / 8008 Cedar Springs Road. Fort Worth Alliance Airport - 2221 Alliance Boulevard, Fort Worth. Addison Airport - 16057 Addison Road / Keller Springs Road, Addison. Dallas Executive Airport - Challenger Drive / South Hampton Road. Northwest Regional Airport - 302 Phantom Way, Roanoke. Grand Prairie Municipal Airport - 3116 South Great Southwest Parkway / East Arkansans Lane, Grand Prairie. Mesquite Metro Airport - 1340 Hudson Airport Boulevard / East Scyene Road, Mesquite. Dallas Area Rapid Transit (DART) - 1401 Pacific Avenue, Dallas. DFW Taxicab - 4315 North Shore Drive. Speed Dreams Exotic Car Rental - 1309 Main Street, Dallas. Silver Image Limousine - 521 North Main Street. Eagle Trailways and Tours (Bus Charter) - 1634 East Irving Boulevard.